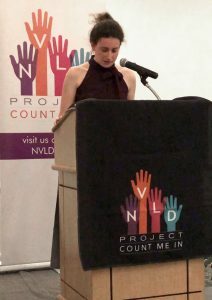 Michaela, a Project Social Ambassador, spoke at The NVLD Project’s Benefit Cocktail Party about her experience with NVLD and what the work we are doing means to her. She shared this poem at the end of her speech and we wanted to share it here as well. It’s being told to work harder. It’s being told you’re not trying hard enough. It’s never feeling good enough, no matter how hard you try. It’s being called slow or stupid, or even worse. It’s feeling isolated from your peers. It’s reading your homework five times and still barely understanding it. It’s teachers who don’t understand you. It’s feeling like no one understands you. It’s not even understanding yourself on some days. It’s parents whose hearts are broken when they see you in tears over your homework. It’s teachers getting frustrated with you and making you feel like you don’t belong. It’s not being given a fair chance to succeed. It’s feeling like you won’t have a future. It’s feeling invalidated over and over again. It’s feeling like you’re useless. It’s feeling like you’re worthless. It’s feeling like your worth is defined by test scores. It’s knowing that your grades don’t reflect your persistent efforts. It’s hidden talents and strengths. It’s finding people who share your struggles. It’s realizing you aren’t stupid. It’s realizing you aren’t alone. It’s realizing you’re worth the world. It’s realizing you can change the world.